It's the inaugural View From Here post! I am pleased to have Kristi Campbell of Finding Ninee here to kick things off. Her Our Land series is beautiful and inspiring. In fact, it may have helped inspire this series. When Jennifer asked me to launch her amazing new series about The View From Here, I have to say that I was above and beyond honored and excited. I mean, come on. She’s not only completely excellent, but is a card-carrying member of Our Land with her lovely contribution. I think her idea for this new series is brilliant and perfect. With that said, I will gladly tell you about my view. From here. And how it’s changed throughout the years. I think, like all of us, that my view has changed a lot over the years. It’s changed drastically in some ways, and stayed the same in others. I remember being eight years old and looking out the window, unbeknownst to the babysitter, waiting for my parents to come home safely. Or, for the cop car to pull up our long driveway and tell me otherwise. Thankfully, it was always my parents. I suppose that that image provides a glimpse into my worried and anxious self, at the age of eight. While I’ve grown more trusting and confident over the years, the worried and anxious part – when it comes to those I love - hasn’t changed that much. And yet, it has. I have years and years that are smiled upon with fondness and memories of fearlessness, daring, and adrenaline. Sky diving. Scuba diving. Testing. Pushing. Pressing the universe for answers about why I’m here, and who I am. I have many blessed years that remind me of the importance of friendship. The kinds of friendships that are almost impossible to maintain once a woman is married, and becomes a mother. Those friendships require time. Time that I – and they - no longer have. But those friendships changed me. They made me me. I have moments with those friends that are so powerful and amazing from 20 years ago that I still cherish them in my heart, nightly. Those friends are still here, in my view, mostly. That particular view hasn’t changed much. But the view of our moments has. While at one time, our views were focused on fun, drinking, boys, and the carefree ability to not worry about whether we showed up to work with less than three hours of sleep under our eyes, and more than three bottles of wine under our bellies, it’s now become different. I’d like to say that becoming a wife changed my view. And it did, in the ways of no longer worrying about the one that I’d hopefully share the rest of forever with. But there’s nothing and no one who has shifted my view – given me glasses to focus on what’s important in life – than my son. 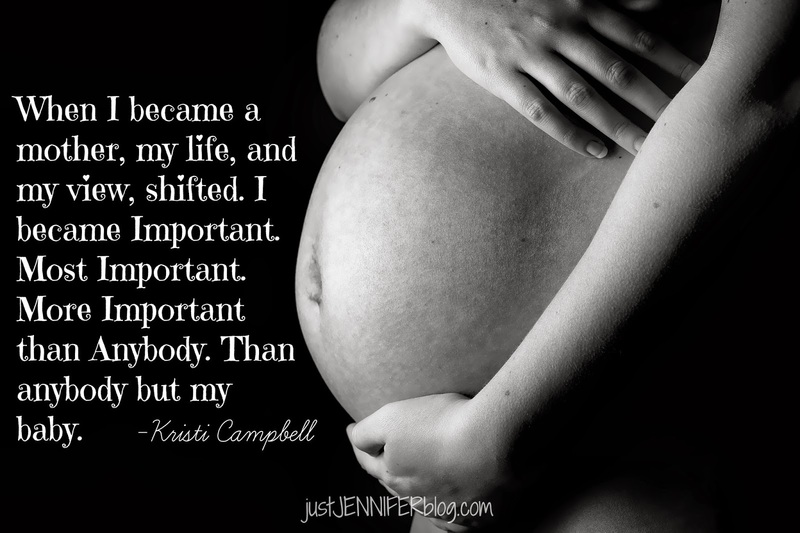 Oh, how becoming a mother shifted my view. Shifted my importance. While once, I was barely aware of the gift of life, and, in fact had the disrespect to feel like it was mine to test, I was, in an instant, right-here aware of it. From one hour to the next, I became hyper-aware of the value of my new son’s life, and of mine. When I became a mother, my life, and my view, shifted. I became Important. Most Important. More Important than Anybody. Than anybody but my baby. What a shift, people. What a shift. I will never skydive again. Why risk it? I’ve had the adrenaline. Now, I have the adrenaline of raising my little boy. And there’s nothing. Nothing that compares to that. I’d always thought that I’d return to work once my son turned four months old. I loved my job. I traveled the world. I was important. Except. Again, a shift. I quit my job about four minutes after my son was born. I took him to swim classes. I took him to soccer. I took him to art, and on walks and on play dates. We were fine. Happy. And then, my view shifted again. We started to notice that our son wasn’t speaking at the same level as other kids. We started to become more worried about him running laps at bedtime, while uttering a foreign, and weird, “eeeaaaahhhhheeeeaahhhhh” noise. We asked his doctor about it. We were sent for evaluations and to Early Intervention. Our view shifted again. We heard the words “speech and language delays.” We heard “autism.” We heard that our baby wasn’t typical and our view shifted. Our importance shifted. Our shifting importance came to include speech therapy, and preschool autism class. Our views shifted to include needing to explain to friends and family that our son is going to have some issues. Likely forever. Our views, they shifted. But you know what? The love never shifted. The point of life, and being here, it never shifted. All of my views led to this one. We had our baby boy. I was 40 years old when I gave birth to my perfectly imperfect perfect little boy. My days now are spent with speech therapy, and Applied Behavior Analysis (ABA). With explaining our new view to our old friends. To family. Sometimes, to ourselves. I wouldn’t trade this view for anything. Ever. Because it’s really the view that all of the views were leading up to, all along. So, I'm holding my breath over here. Not only was this a perfect post to kick off this series, but yeah, your child(ren) change your View more than anything else ever could. on her Blog, Facebook, Twitter and Google+. *For more info on The View From Here, <-- please click!